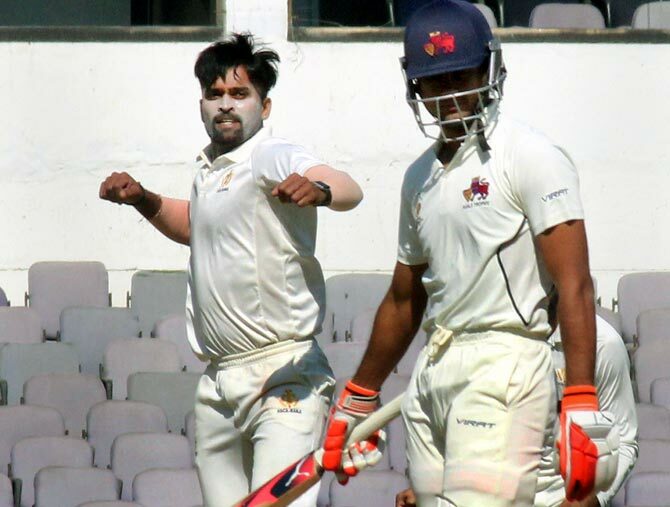 Nagpur, Dec 11: Spinner K. Gowtham's six-wicket haul helped Karnataka beat record champions Mumbai by an innings and 20 runs to seal the semi-final spot on the fourth day of the Ranji Trophy cricket tournament here on Sunday. Faced with a first-innings deficit of 397 runs, Mumbai were bundled out for 377 in their second innings. Resuming the first session at 120/3, Mumbai's overnight batsmen, Suryakumar Yadav (108) and Akash Parkar (65) played brilliantly. The duo added 98 runs for the fourth wicket before Yadav was run out by Gopal. Siddesh Lad (31) then joined Parkar in the middle and the pair added 52 runs but soon Karnataka skipper and pacer Vinay Kumar dismissed Lad. Vinay then dismissed Mumbai captain Aditya Tare on a golden duck. Towards the end, Shivan Dubey (71), who had taken five wickets, put up a valiant fight but that was not enough for Mumbai to save the match. In other matches, Bengal scored 483/4, swelling their lead to 613 runs against defending champions Gujarat on the fourth day. W.B. Chatterjee (213), A.P. Majumdar (6) were at the crease when the umpires dislodged the bails for the day. In Vijayawada, Delhi scored eight runs at stumps on the fourth day, needing 209 runs more to win against Madhya Pradesh. Openers K. Chandela (4) and Vikas Tokar (4) were playing when the umpires called off the day's play. In Surat, Vidarbha scored 431/6 in the second innings, taking a healthy lead of 501 against Kerala on the fourth day of the match. Wicketkeeper-batsman A.V. Wadkar (20) and K.V. Sharma (4) were batting at 20 and 4 respectively.